Ten Ren's Fifth Grade Jasmine is a good quality jasmine tea. 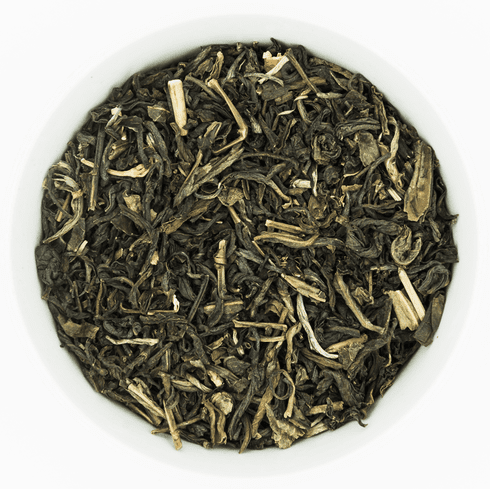 This jasmine tea consists of Chinese Green Tea (Pouchong), grown in Taiwan, and is scented with jasmine petals. Accompanied by a few jasmine petals, these leaves are larger than green tea leaves and rolled. Tea made from these leaves have a yellowish-green hue. It has a mild floral scent, light refreshing taste, and a lingering aftertaste that is decidedly pure and natural. The water used to steep this tea should be about 160-180�F or 70-80�C. Use about 1 tablespoon (3 g) of tea leaves for about every 5 ounces (150 mL) of water. A steeping time of about 3-5 minutes with more or less time is recommended depending on the desired concentration. As a rough guide, the hotter the water or the greater the amount of leaves used, the shorter the steeping time should be. The use of a covered glass or ceramic cup is recommended for steeping in order to appreciate the tea leaves. Net tea weight 4 ounces (113.4 g) and shipping weight 0.29 lb.